Fundraiser by Gwendilin Boers : Brazilian Babies to Canadians! We are Birch Haven Rescue & Rehablitation Services(BHRR) located in Eastern Ontario, Canada. We are a federally registered Great Dane/Giant Breed Rescue that has been operating since 1996. We focus strongly on the special needs and provide a safe Haven for those dogs that are deemed unadoptable due to medical and/or behavioural reasons. 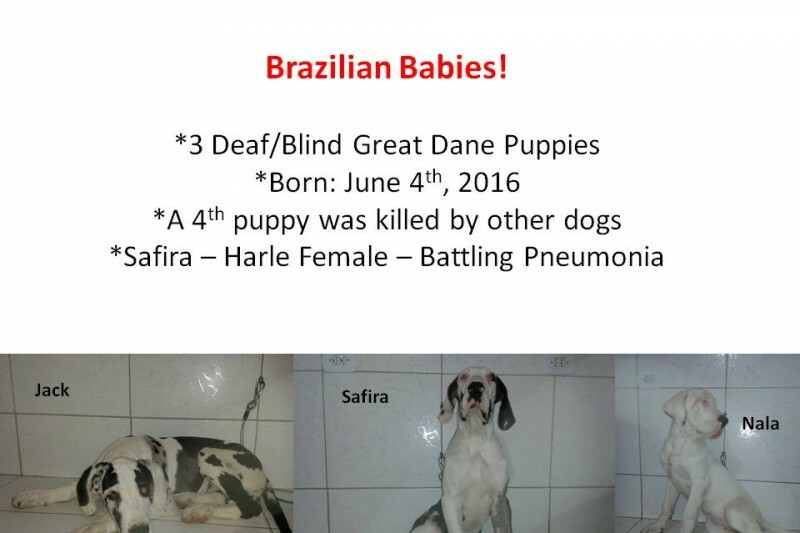 The purpose of this page is for supporters of the Brazil to Canada - Dane Angel Network to come together to help rescue/save three special needs Dane puppies. They are all deaf/blind and were born June 4th, 2016. This is our biggest rescue effort to date and we need your support to make a miracle happen for these three deserving puppies. They are currently residing with an *independent* rescuer in Brazil and their chance of a quality filled future is slim. We are also helping to currently treat one of the three remaining special needs puppies for pneumonia - they were all altered prior to our awareness in not the best of circumstances. 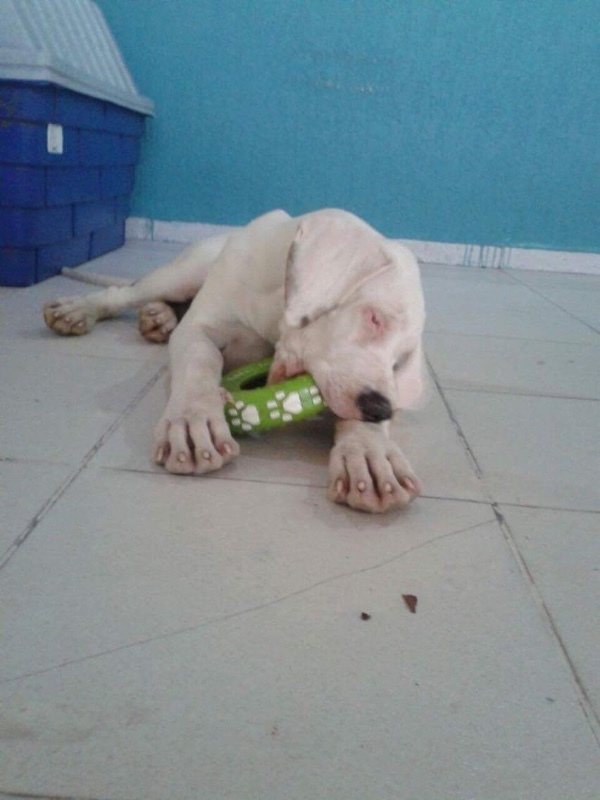 We have been sending money to this independent rescuer *Ana* in Brazil to help pay for dog beds, blankets, good food and also to cover vaccines, de-worming and flea/tick plus heartworm prevention. Our strong position is that dogs do not know countries or borders. A dog in need is a dog in need and these are the next in need of our specialised programs. This is why we were founded in 1996. We are working with a local Pet Transport Company as we want to ensure that everything is done by experts to ensure their safe passage from Brazil to Canada. We know this shall be a costly rescue mission and our goal is to have them here within the month after we meet all vetting and paperwork requirements. So we have a tight deadline! This gofundme page is for angels to come together in support with fundraising to help these three babies that are deeply in need of the BHRR Village to come together to surround them with kindness & helping hands. For them to have a quality filled life - most dogs, not all - in Brazil are also kept outside, they need a Haven such as Birch Haven Rescue & Rehabilitation Services(BHRR) that can help them live to their full potential of happy quality filled lives! We will teach them scent plus touch training and we are committed to them for their lives. Donations can also be made via email transfer too! Please help us help them.....with sincerest gratitude and humble thanks, please work with us to get them to Canada. *Nala* & *Jack* went to the Vet yesterday in Brazil. They are being de-wormed with Panacur plus also Drontal as they have a severe tapeworm infestation. I have also asked re: Coccidia treatment for them. *Nala's* poop is so full of blood. Both have had terrible diarrhea. They were weighed - *Nala* is 25.2 Kgs and *Jack* is 26.5 Kgs. They turned 4.5 months old today. Both are also on Revolution for fleas, ticks & heartworm. With Maira's own kind donation of funds for their boarding to keep them safe plus better food, they are eating a higher quality of food which is so important. Unfortunately, *Nala* was running a fever and so we also ran blood work. Poor *Nala* is tick borne disease positive & she is now on a minimum 30 day course of Doxycycline. She remains playful, affectionate and is eating plus drinking well. The photo is of *Nala* playing with her first ever toy in her life. 4.5 months of age and never had a toy. I am paying for all of their Vetting in Brazil out of my own pocket and all money raised in this rescue effort campaign is to get them safely to Canada. The funds that we are trying to raise shall go towards paperwork, health certificates, translations of paperwork, the custom crates needed for these two growing puppies, permits, their flights, transport to the airport, terminal fees, CSBA fees, custom clearances and so forth. My plan is to make the drive to Toronto when they arrive, to pick them up and bring back with me to Oxford Station. We are so close to our goal now. We have until end of the 23rd/beginning of the business day on the 24th to make this miracle happen for them. Please with tears in my hearts, please do consider helping us assist them....they are so deserving. They shall die if they are not saved...if we had not promised to go legal when we did, *Nala* would have been the next to die after her sister so horrifically died. Then it would have been *Jack*. Thank you in advance for any consideration to this campaign! *Nala* playing with her first ever toy! We have now had $1,985.00 generously donated between Supportive Angels & BHRR's Flame Adoption Fee! We are also so heartbroken to post that *Safira* passed away October 11th, 2016. If she had been here in Canada, we could have saved her. Unfortunately, she was kept outside despite all of our pleas to have cared for inside. We offered to even pay to board her at a good Vet Hospital to no avail. We donated funds to try and ensure proper medical care for her, yet she ended up dying alone, cold, unable to breath well and unable to eat properly. We can happily report that as of this AM, we finally have the remaining two puppies *Jack* & *Nala* in a safe trusted place. It has been a long stressful plus worrisome effort to get them to safety. We need your assistance to make this miracle happen for these two remaining deaf/blind babies. They do not know borders or countries. They know hunger, fear, confusion and please consider helping us help them. Please with all of our hearts consider their cause. You have now now helped us raise between sharing plus the most generous and kind donations including with BHRR's Flame's Adoption Fee - $1,580! We still are in urgent need of $3,420 to make this rescue miracle happen for these three sweet and precious blind/deaf Great Dane puppies. 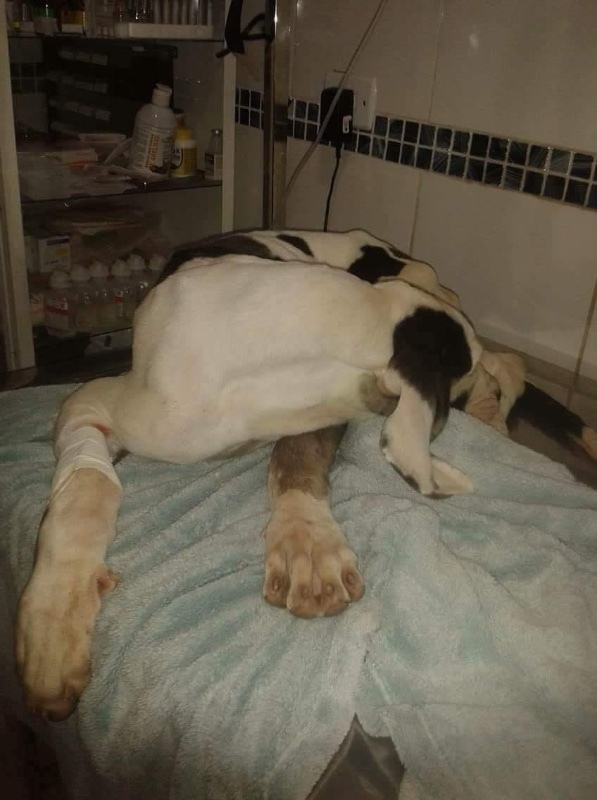 *Safira* at the Vet - she collapsed and was rushed in and diagnosed with pneumonia. 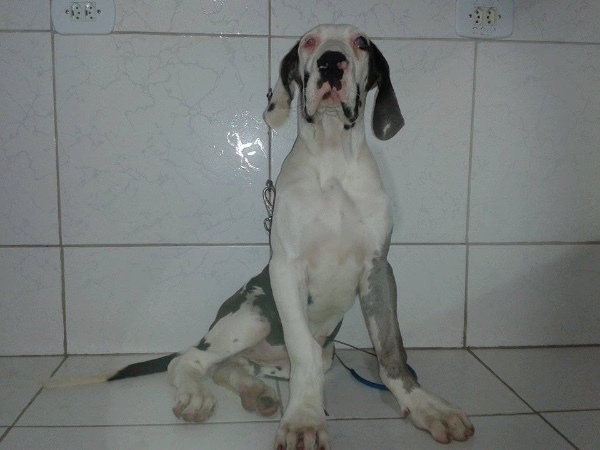 Donations sent by deeply caring plus generous PayPal Brazilian Dane Baby Angels plus raised by Pet Valu Stittsville - Rounded up to the nearest Dollar as gofundme will not allow me to put in cents. Three more truly special and heart-warming donations sent via email transfer. Thank you! This is the message that these amazing Brazilian Baby Angels sent and wish to keep their names anonymous. I do not even know who they are all as they are being kept anonymous from us also...yet how thankful and appreciative we are to ALL of them! "Hi Gwen, This is the approx. amount that has accumulated since I have started collecting empties/spare change as well as private donations. There have been some wonderful people I have been in touch with who are willing to support the cause :)"
Thank you to another special Brazilian Angel who made such a caring donation via email transfer. Another truly thoughtful and so very generous donation for the Brazilian Babies has come in via email transfer! We had two more thoughtful plus generous donations come in via email transfer to help the Brazilian Babies!